While Euro-Zone’s Final Consumer Price Inflation reached its lowest level, there are no major economic reports to give EURUSD an upward push. The support rests at 1.13810 with resistance at 1.14010 which both lines are below the weekly pivot point at 1.14790. The EMA of 10 is moving with bearish bias in the descendant channel and it is below the EMA 100 and the EMA of 200. 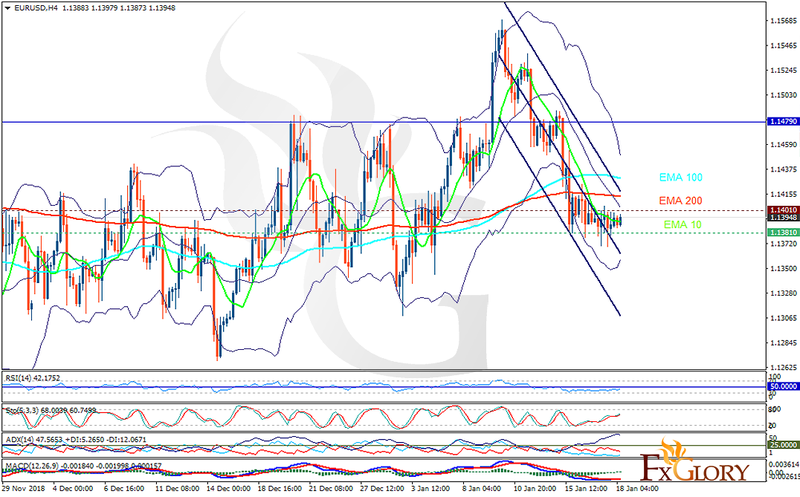 The RSI is moving below the 50 level and the Stochastic is moving in high ranges. The MACD line is above the signal line in the positive territory. The ADX is showing weak sell signal. Indicators are showing mixed signals. The resistance level breakout may push the pair up towards the upper Bollinger band at 1.145; otherwise, EURUSD may continue its bearish trend towards 1.135.